Stroll through Tokyo’s kitchen, Tsukiji Fish Market, and delight in the tastes, smells and sights of the world’s largest fish market. Discover new flavour sensations and find out more about the people who work here. Round off the morning with an introduction to sake and a spirited tasting to whet your appetite. Spend your morning with us exploring Tsukiji Fish Market, the largest fish market of its kind in the world. We will start by wandering through Tsukiji’s outer market, which is brimming with vibrant food stalls and retail shops. This is the place to be if you’re looking for the freshest and dare we say, most delicious sushi breakfast one could ever hope for! With over 2,500 tons and 450 types of fish coming through the market every day, you’re bound to come across some foods and fish you’ve never seen before. Squid jerky, anyone? Or perhaps scrambled eggs on a stick? No matter what kind of unusual snacks you may encounter, Tsukiji promises to be an experience for all five senses. Along the way, your tour guide will explain about the history of the market, all the different seafood on offer, the legendary tuna auction (not included in the tour) and what a typical day is like for all the vendors who work inside the inner markets. We’ll stop to sample a couple of fresh foods, and you’re free to try any additional snacks at your own expense that may catch your eye or make you drool. Of course, it can be difficult to know where to start so your guide can point out some recommendations as well. Once we’re finished snacking, we’ll make our way to a nearby sake shop for a tasting and introduce you to Japan’s beloved beverage of choice. Learn how to taste the difference between different sake and about the role it has played in Japanese culture. Be sure to tell us your favoritism! 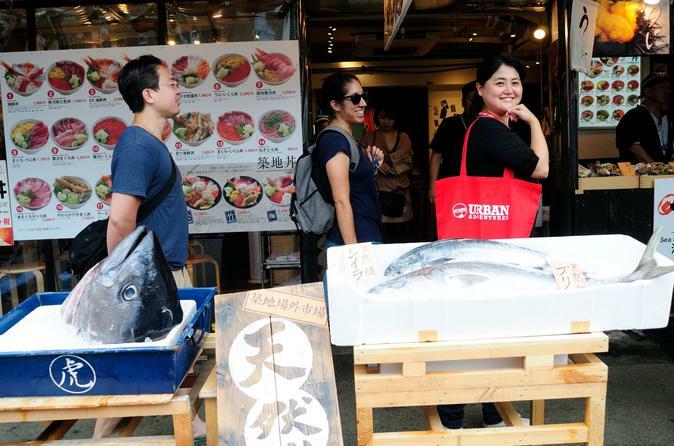 As tour groups are prohibited from entering the inner markets, we’ll leave you at the door to Tsukiji’s inner markets where you can go explore on your own and watch the wholesale vendors in action. Watch your step because things can “get a little fishy” as you carefully maneuver through the market’s chaotic, narrow and wet streets. Though visitors are not allowed to take photos inside the inner market, you won’t forget this extraordinary experience! But before you go off on your own, don’t forget to ask your local guide for tips on where else to visit during your stay in Tokyo.